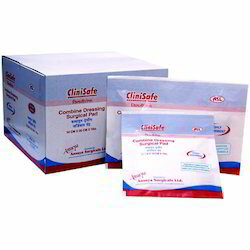 We offer Clinisafe Combine Dressing which is non adherent absorbent over wrap enables dressing to be changed and wound can be inspected without disturbing the healing process. Sterilized by Gama Radiations. 10cm x 20 cm (Pouch Pack).